Once you get in the habit of searching for column ideas, you often don’t have to look very far. Sometimes they fall into your lap during Sunday School. My church—First United Methodist in Cookeville—was preparing to welcome a new senior pastor earlier this month. My adult Sunday School class had been asked to prepare several dozen sandwiches to be served at the meet-and-greet reception. As the sign-up sheet was being passed around, questions arose. Should the sandwiches be sliced? If so, into two pieces or four? Were those pieces to be triangles or rectangles/squares? Should we cut off the crusts or leave them on? Wheat bread or white? What should be on the sandwiches? Ham salad? Egg salad? Tuna salad? Chicken salad? Perhaps peanut butter and jelly to satisfy the palates of the younger members of our congregation? After a great deal of amusing but inconclusive discussion, it was decided that the sandwiches should be cut in half. All other decisions would be left to the discretion of the sandwich makers. I knew exactly what I was going to make. 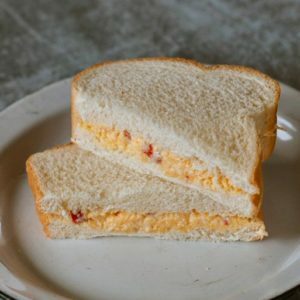 Pimento cheese on white bread, crust on, cut into triangles. I’ve always loved pimento cheese. When I was little, my mother had a hand-cranked metal grater with a red wooden knob on the handle. She’d put a block of sharp cheddar into it and turn and turn and turn that handle until the cheese was a mass of bright yellow shreds. Mother would dump those shreds into a mixing bowl and add a jar of pimentos and several spoonsful of Duke’s mayonnaise (“the secret of Southern cooks”) and stir until it was perfectly blended. Then we’d slather the delicious concoction onto soft Wonder Bread, add slices of homegrown tomatoes and cut the sandwiches diagonally. That’s what I was going to fix for the preacher’s reception, with a few changes. Obviously, a homegrown tomato would not be possible in March. And because I don’t know whatever happened to my mother’s hand-cranked metal grater except that I didn’t inherit it, I’ve taken to buying already-made pimento cheese at the grocery store. This used to be unsatisfying when the only choices were Price’s or Mrs. Grissom’s. But now that I’ve discovered Palmetto Cheese Spread with jalapenos, made in South Carolina by Pawley’s Island Specialty Foods, I’ve decided there’s no reason to ever dirty a cheese grater or a mixing bowl again. The bad news and the good news is that the sandwich sign-up sheet was filled before it got to me. The other good news is that the reception for Reverend Kevin Conrad and his wife Kathy was well-attended and there was plenty to eat, as is always the case when Methodists gather. I’m also delighted to report that at least two-thirds of the sandwiches were pimento cheese, which is really not surprising. Some foods just stand the test of time. Especially in the South.